How should I count my local employees to calculate my Work Permit and S Pass quota in Singapore? Your local employee must earn the Local Qualifying Salary (LQS) of at least $1,200 before they can be counted towards your quota entitlement. 1 local employee if they earn the LQS of at least $1,200 per month. 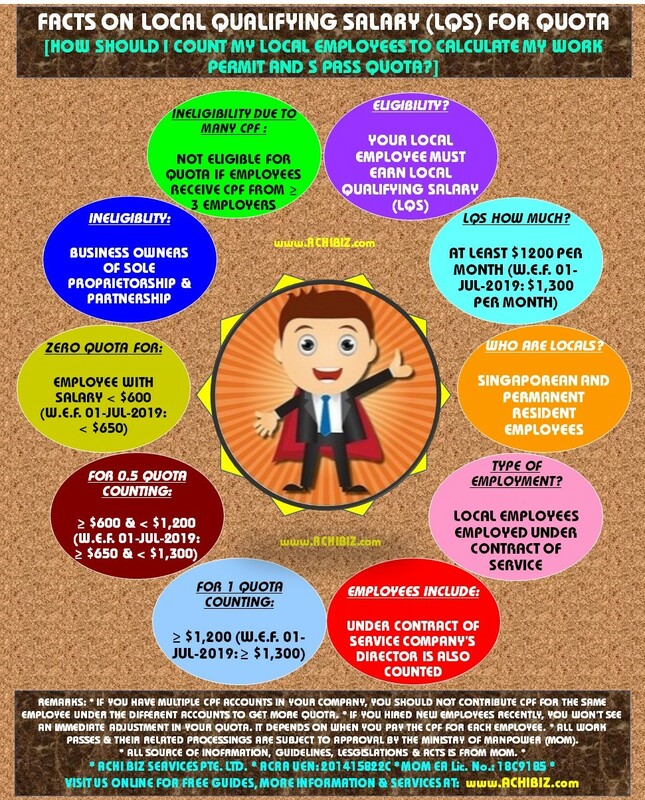 0.5 local employee if they earn half the LQS of at least $600 to below $1,200 per month. Employees A and B are considered 2 local employees because they each earn at least $1,200. Employees C and D make up 1 local employee because they each earn $600 to below $1,200. Employee E is not counted because the salary is below $600. 1 local employee if they earn the LQS of at least $1,300 per month. 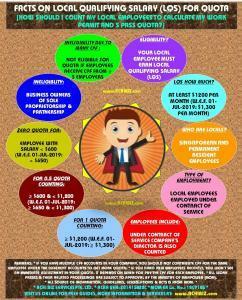 0.5 local employee if they earn half the LQS of at least $650 to below $1,300 per month. Business owners of sole proprietorships or partnerships. Employees who receive CPF contributions from three or more employers. If you have multiple CPF accounts in your company, you should not contribute CPF for the same employee under the different accounts to get more quota. If you hired new employees recently, you won’t see an immediate adjustment in your quota. It depends on when you pay the CPF contribution for each employee. The Local Qualifying Salary (LQS) determines the number of local employees who can be used to calculate your Work Permit and S Pass quota entitlement. The LQS was previously known as the Full-Time Equivalent salary. The LQS ensures that local workers are employed meaningfully, rather than being employed on token salaries to allow the employer access to foreign workers. This also ensures that our quota controls remain effective and keep pace with income levels. 5 local employee if they earn half the LQS of at least $650 to below $1,300 per month. For all types of Work Passes with their related matters is from the Ministry Of Manpower (MOM), TAFEP &/or Immigration And Checkpoints Authority (ICA), Singapore accordingly. For all other matters are from the relevant Authorities or Agencies of Government of Singapore.